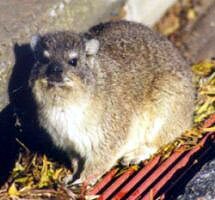 Named after the large number of Dassie's (Afrikaans name for Rock Hyrax) that abound around the two cottages at Jongensgat Private Nature reserve. (Strangely, despite their size, these little animals are the closest relatives to the elephant family). 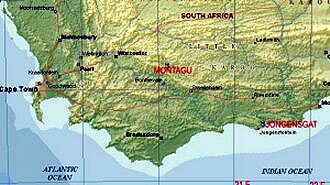 Jongensgat (34 24 51S / 21 22 39E) is 8 km from the fishing village of Stilbaai and about 350 KM East of Cape Town. This prime DX site with its 2 isolated wooden cottages is only 60 meters from the Indian Ocean. There is a clear outlook over the sea to the South East (Australia). Reception to the North West was somewhat blocked by hills and mountains inland, but good results were nevertheless obtained from N&S America. The primary objective of the DXpedition was MW stations from Australia (and hopefully the South Pacific) so the site was ideally situated for that. 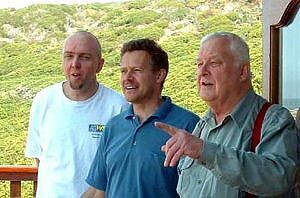 Those that attended were John Plimmer, Gary Deacon and myself, Vince Stevens. Denis Johnson also joined us for one night. The location was so pleasant that all our spouses decided it was good enough for them too, so we had a real family atmosphere in the houses. Gary's source of QRM, his 5-year-old daughter (and budding DXer), Nicole made up the numbers! The trip produced some interesting DX with a few stations heard for the first time. Good reception from Australia during the evenings preceded a strong Brazilian presence in the late evening/early morning, followed by limited openings to the USA/Mexico/Caribbean from pre-dawn until sunrise. Reception during the first evening was really encouraging! A strong Western Australian presence included a few stations from South Australia and Queensland. 6WF 720 was heard until transmitter sunrise around 2245 UTC! Australian MW stations generally fade out much earlier in favour of signals from Africa/Middle East, which normally dominate the band all evening. Dawn X-Band reception included USA station KRJO, Monroe LA 1680 kHz and Mexican station XEPE, Tecate 1700 kHz (under KVNS, Brownsville TX), both noted for the first time. Outstanding reception from Western Australia occurred in the evening, even better than on the night before. 6WF was already evident at 1505 UTC (5:05 PM local time) with the afternoon sun still quite high up in the sky! South Australia and Queensland were also heard. This was probably one of the longest and most consistent openings to Aussie that any of us have ever experienced. A "hyrax" is an ungulate about the size of a rabbit and they are diurnal. Morning Trans-Atlantic reception only average. Strangely enough Australia was conspicuous by its absence during the first three hours of listening on the final evening. Reception conditions had obviously changed dramatically from the previous day, but some Aussie stations suddenly appeared around 18:00 UTC. Overall the Far East was dominant, a total contrast to the previous evening. MW DXing continues to provide surprises!. The last morning was the best one for North America. The X-band was quite active with more than one station on a number of frequencies. KCJJ-1630 and KGA-1510, plus Mexico-1700, the highlights. Receivers: Drake R8B, Drake R8A, Yaesu FRG-7 and preselector. Antennas: 3 Beverage antennas of between 150, 300 and 350 metres in length, at bearings of 335, 310 and 285 deg respectively. Plus a Kiwa MW Loop and a Datong AD370 active antenna for tropical bands. 666 1915 REUNION R.Reunion, St.Pierre in FF w anns - Very good on all evenings. 729 1640 AUSTRALIA 5RN Adelaide - good peak 12/9. Also at 2008 w vintage BBC Comedy. 1395 1528 AUSTRALIA 5AA Adelaide - poor/fair 13/9 also 12/9 w phone-in, fair-good at 1730. 1690 0340 UNIDENTIFIED in Spanish - fair w QRN 14/9 also on 15/9 w ID as "R. Transmundial"